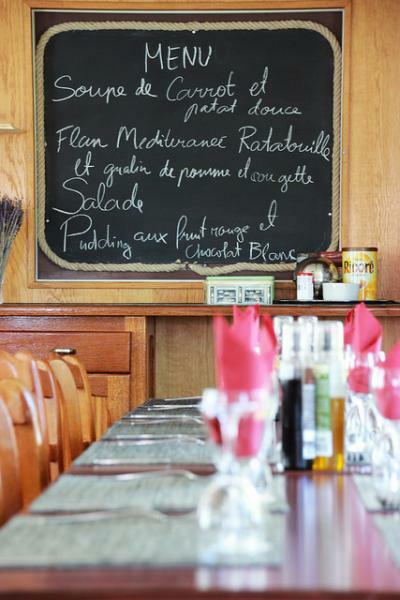 with two days in Nice - the French Riviera! We will fly from Tampa to Lyon France where we will stay 2 nights before departing for the Bike & Barge! 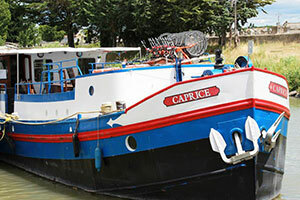 We will bike through Avignon, Aramon, Arles, and Aigues-Mortes for 7 nights aboard the Caprice. Among the wilderness of Camargue and the landscapes that were so dear to Van Gogh, you will cycle through delightful Provençal villages, vineyards and fields of sunflowers. Aigues-Mortes is a completely walled town that has changed little in appearance since its glory during the Middle Ages, and Avignon, a UNESCO World Heritage Site, is ancient, full of history, life, youth, art, music and activity. After a week of biking we will visit Nice for 2 more days before heading home! Trip includes air, transportation, most meals, bike rental & bike insurance and much more! Physical requirements (Grade 2) - the route is on countryside roads with little traffic in rural and city areas. Daily routes average 28 to 34 miles. Terrain varies from flat to hilly with some climbing involved. 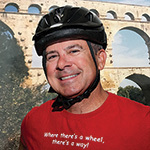 Helmet use is mandatory on all bike tours. Transfer between Lyon and Avignon barge port to meet the ship via private coach with English speaking assistant. 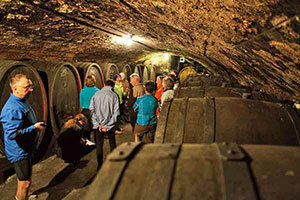 Transfer will include stop at Senanque Abbey to photograph the lavender fields. Transfer between hotel and Nice Airport via private coach with English speaking assistant. 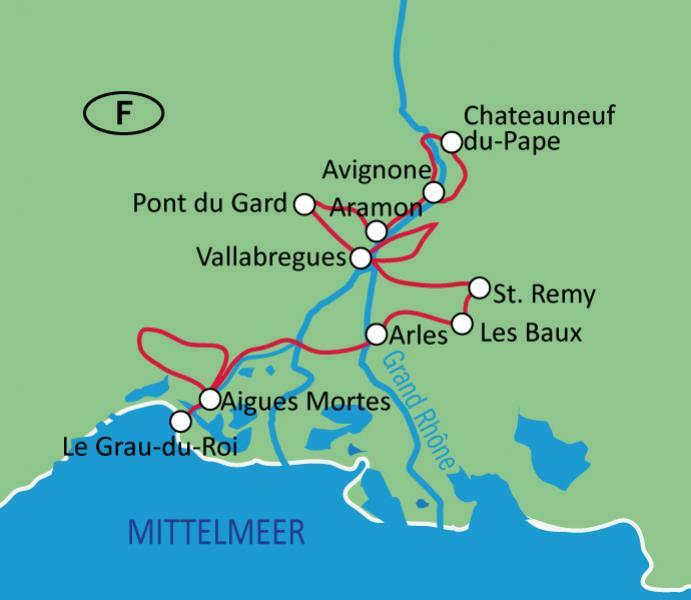 Today, we’ll get to the other side of the river Rhone by crossing the island Île de la Barthelasse, and we’ll ride in the typical garrigue landscape, between vineyards and orchards. Before going back, we’ll visit Villeneuve Les Avignon, once known to be the town of the cardinals. 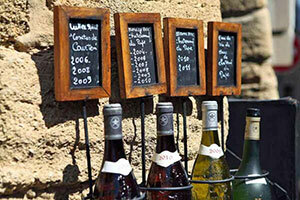 In the afternoon, a guided visit will let us discover the historic centre of Avignon. In the morning, we continue on the barge ‘til the town of Aramon, where we will start pedaling. 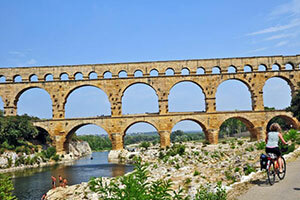 The stage today will bring us to the best preserved Roman aqueduct in Europe: Pont du Gard, a very spectacular work. 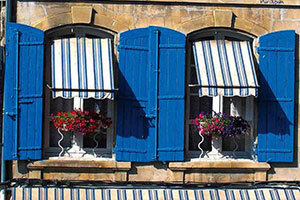 Overnight, we will stay in Aramon, with a beautiful view of the Mont Ventoux. This stage brings us to Saint Remy de Provence, birthplace of Nostradamus. This village is also famous for hosting Van Gogh in the days of his mental illness. In the end, we move onto the Alpilles, with Les-Baux-de-Provence, a village lodged in the rock itself. A landscape of limestone cliffs and olive trees accompanies your journey. Today, the whole morning is dedicated to visit Arles, the ancient capital of Gaul with beautiful Roman ruins. We will also have the opportunity to be welcomed by a professional guide, who will accompany us around the jewels of the town. 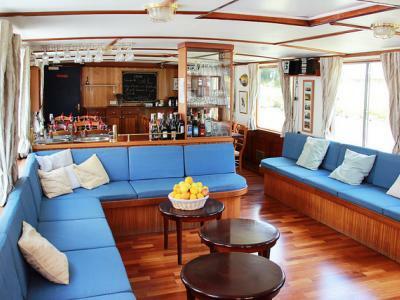 After lunch, we reach the lock of Saint Gilles and from there we will sail to Aigues Mortes for the overnight stay. Going through small country lanes of Camargue between canals, lagoons and small villages, we will reach in the afternoon the charming fishermen’s village Le Grau-du-Roi. There is the possibility of a refreshing bath on the beach. If you are interested in traveling on this Bike & Barge trip please mail application with deposit ($1,000 check made payable to TBSS&B) to Joe Bayliss, 4141 Central Avenue, St. Petersburg, FL 33713. The B&B trips have limited space so travelers will be accepted in the order that the application/deposit have been received. All cancellations must be received in writing by May 31, 2019. See cancellation policy on the 2nd page of the trip application.